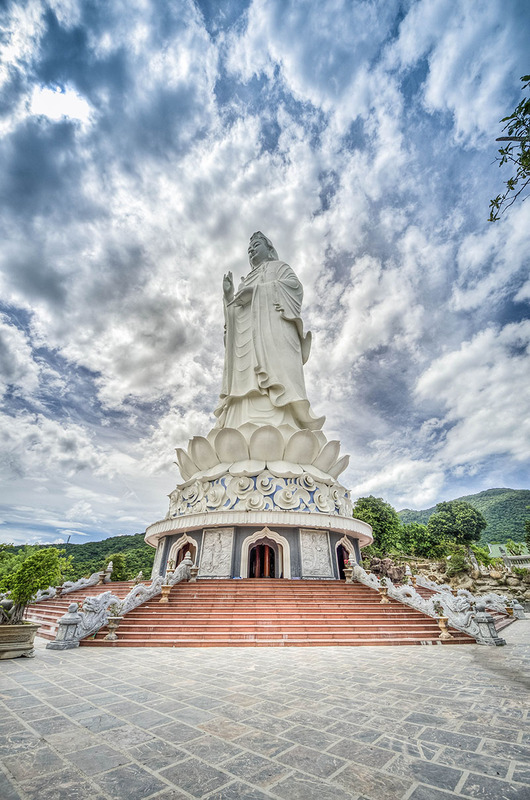 Linh Ung (or “Miraculous”) Pagoda is located on Bai But, Son Tra Peninsula, around 10km to the North East from Danang city center, initiated by the late Buddhist monk Thich Thien Nguyen. The Pagoda was set to construction on 04/07/2004 (on 19/06 Giap Than Year) and inaugurated on 30/07/2010 (on 19/06 Canh Dan Year). The pagoda lies on a beautiful landscape: mountains behind, ocean in the front, with a unique, unconquerable beauty. Back in the old times, this place was a remote, untouched hilly area. It took a great effort to build and create such impressive works as Linh Ung Pagoda. Legend has it that during Ming Mang Emperor time, on an early morning, some fishermen found a small Buddhist statue emerging from the sands. They received the statue and created a small temple to pray. This land was also then called Bai But (the land of Budda). From that moment on, the land was very peaceful and the fishermen had a very good life. According to Buddhist monk Thich Thien Nguyen, after unification day, he had a chance to visit the area by boat and contemplate Son Tra on a quiet afternoon with beautiful, poetic views. Taking into consideration the legends and the views, Thich Thien Nguyen wished to build a pagoda here. It finally came true. After he finished building Linh Ung Pagoda on Bana Hills, the authority of Danang gave the permission to build a pagoda here (in 2004). Linh Ung Pagoda – Bai But was built on an area of 20ha with different elements. From the main entrances, one can see 18 La Han (Eighteen Arhats) solemnly lining up in two rows leading to the main temple. The main temple is the praying area, in the middle is Siddhārtha Gautama, on the right is Avalokiteśvara, and on the left is Kṣitigarbha and The Four Heavenly Kings. The unique feature of the pagoda is the Avalokiteśvara. This is the most special and unique religious works, built with much efforts, talents, sweats and tears. Originally the statue was planned to be 32-meter high, but eventually was finished at 67-meter high, the diameter of lotus support was 35 meters. This shows that maintenance and reinforcement were very difficult. This is the highest Avalokitesvara statue in South East Asia (recognized by UNESCO). Inside the statue, there are 12 levels, each with different altars. The altar on the ground floor is for worshipping Avalokiteśvara and Kṣitigarbha. The second floor to the 12th floor are for worshipping Avalokitesvara in different forms, and the top floor worships The Seven Buddhas of Antiquity. The importance while building the statue that was stressed by the late Buddhist monk and the artists was how to express the four immesurables: oving-kindness or benevolence (metta); compassion (karuna); empathetic joy (mudita); equanimity (upekkha) of the Buddha. The standing position of the statue, leaning on the mountain, looking at the ocean with a empathetic eyes, like giving love, kindness and mercy to all human beings. The views at the main temple in combination with Avalokitesvara Statue create a holy, religious and solemn overview. To be able to create such landscape, it took a lot of efforts and investments. Nowadays, most of the elements of the construction are completed. Another works that the late Buddhist monk hoped to realize was the statue of Siddhārtha Gautama on a lotus flower. The creation of the statue will be proposed by the Buddhist monk who succeeded the late one when affinity comes. 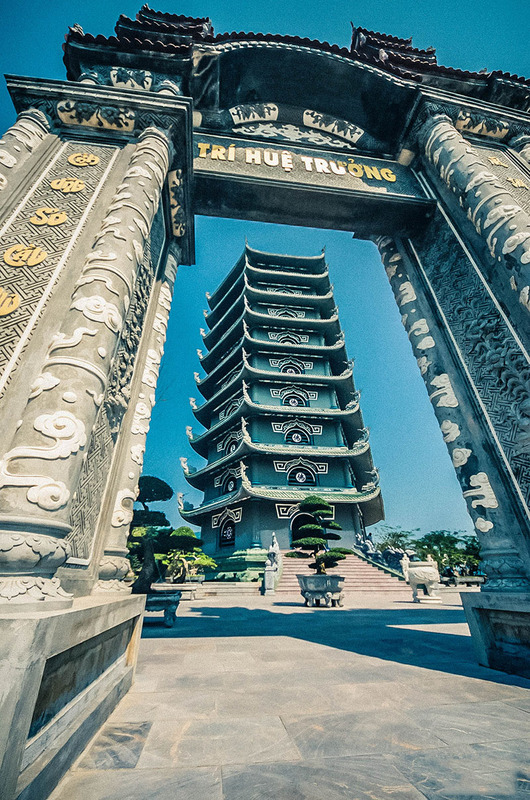 Linh Ung Pagoda has long been one of the most popular religious destinations for Buddhists, domestic and international tourists to Danang. The pagoda has a spectacular and poetic view, an attractive legend that attract tourists for all over the world to come to contemplate and worship. Coming to Linh Ung – bai But, you will have an opportunity to explore Buddhist culture with a unique and diverse eco-system here.